Six in the morning. We spent the last night at anchor hidden behind île aux Prunes on the St Lawrence River. While preparing the Lois for her trip to Montreal, a big Maersk Line boat approach us in the main channel. Our partner in Montreal, Simon Lebrun, is on board the Maersk Pallerno as a pilot for the run from Montreal to Trois Rivières. High near the pilot house he is looking at us through his binocular. Then the boat is blowing the big bass horn and we are answering with our smaller one. I am certain that everyone living in the area knows of our presence! 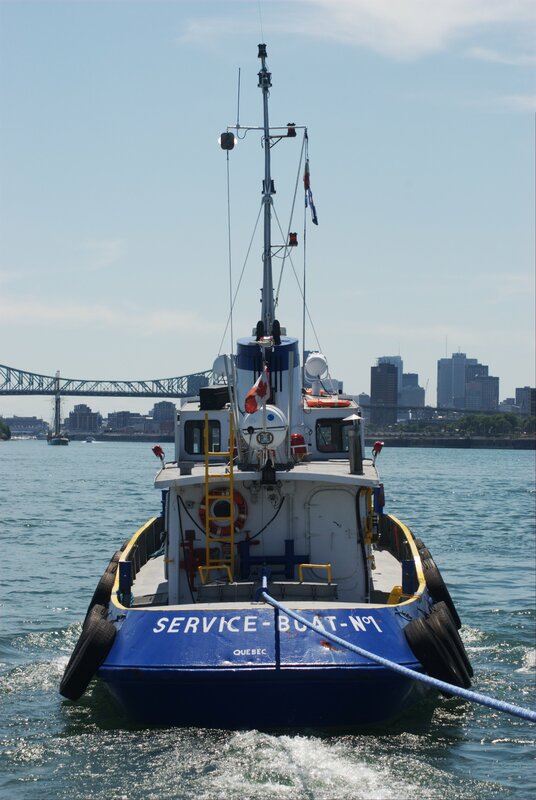 We are now on our way to Montreal.. As we are closing to the former Vickers shipyard, our little helper (Groupe Ocean Service-boat-No 1 )is approaching. The Vickers was the only shipyard in Canada building submarines. During the first World War, they got the contract from the Imperial Russian government for eight subs. By the time the were delivered Russian became Soviet Union. So the first Soviet subs were Montrealers! We are now towed. Like four years ago, we discovered the strength of the current in the St Lawrence River as we come through the Port of Montreal. As we are passing the Molson brewery, I am thinking of the PS Lady Sherbrooke, the fourth steamboat of the Molson line. From 1983 to 1993 we excavated her with my late friend André Lépine. Molson boats have a very special connection with the war of 1812. The second Molson steamboat the PS Swiftsure (PS stand for paddle steamer) was the first steamboat used in military operation. She was used as a troop transport during the war. 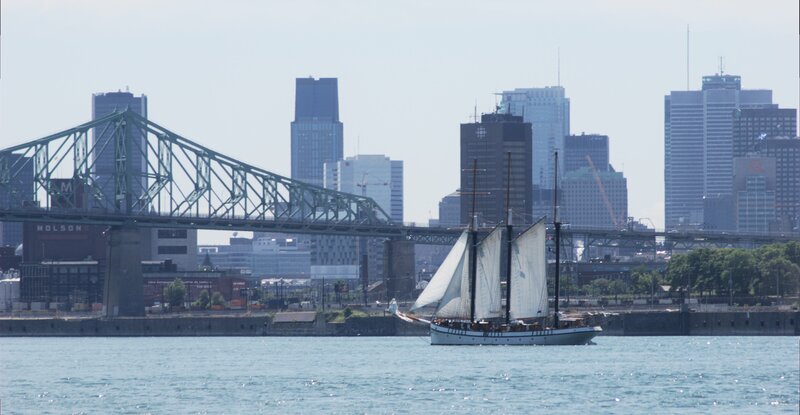 As we pass under the Jacques-Cartier bridge, we can see a large threee masted schooner turning with her sails up. It is the Empire Sandy, who is docked in the Jacques-Cartier basin, right down the dock from where we will be. As we safely come through the current to the Old Port, we cast off the towline from Service Boat No. 1 but they stayed not far in case we needed them again. Very nice on their part! We are now entering the Jacques-Cartier basin. The Empire Sandy is just ahead of us. Two large sailing ship entering at the same time in the basin is a very rare sight. Finally we are at our dock and suddenly it is hot, very hot, something around 90 F. And waiting for us on the dock, is Simon Lebrun. He left his big boat at Trois Rivières and rush back by car in time to welcome us in Montreal. As we have few things to do after setting our exhibit I am heading for Pointe à Callière Museum to visit the samurai show. It is excellent. Next day we are in business. We have a VIP reception organized by Simon Lebrun. Many important visitors are on board: the American consul in Montreal, the director of the Old Port, several politicians and Louise Potier from Pointe à Callière. Louise was long time ago part of my crew of the PS Lady Sherbrooke project. Friday, we are now open for public boarding. They need a lot of courage to get to the boat. It is so hot and we are at the end of the dock, far from the shore. It is starting slowly and we discovered that many people think that they have to pay for visiting us. So Pierre Valiquette, one of our volunteers, go on the dock to inform people passing by that it is totally free to visit the boat. It worked perfectly and suddenly we have many more visitors. We ended up taking turns at the end of the dock, engaging visitors in discussions and urging them to visit the boat. High above us on the pier, the famous Cirque du Soleil is presenting their newest show Amaluna. Several member of the crew were unable to resist, and attended the last presentation of the show. A handful more of the crew attend a very special presentation of the famous movie with Marlon Brando, Mutiny on the Bounty, presented on a big screen in the park across the way. It is quite special. We are sitting outside looking at the film on a large screen when suddenly Simon bring the popcorn! No good movie is complete without the taste and the smell of fresh popcorn! 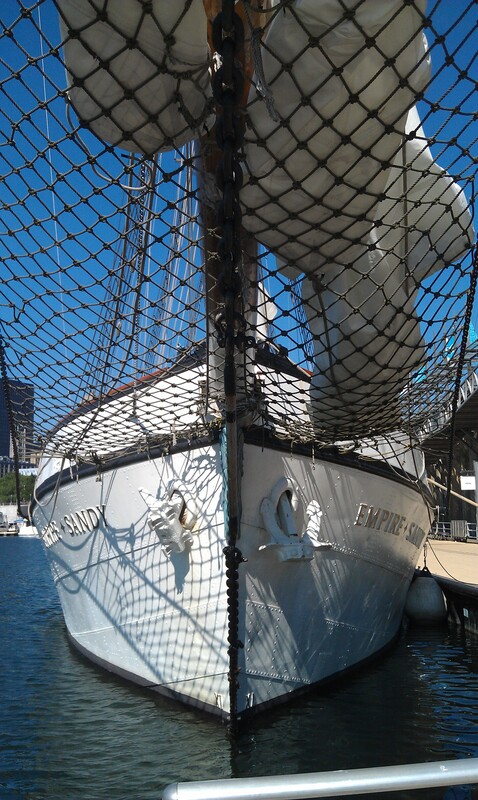 As part of our stay in the Old Port, we learned about our dockmate, the Empire Sandy. Originally she was a ocean going tug built during the second world war to rescue crew of torpedoed boats. She didn’t have any rigging but she had a gun. She was converted into a sailing boat for tourist purpose. So naturally several members of the Lois crew were interested by her and were allowed to sail on her during their break from interpreting. Her bowsprit served as a kind of entrance arch for our visitors. It was really neat. Time is running fast and it is now time to leave Montreal for Lachine on the west end of the island, just 10 miles from the Old Harbour. While we are casting off the Cirque du Soleil is dismantling his chapiteau. They too are moving today. We are now leaving the basin and the Empire Sandy is blowing her horn to salute us. We are returning the salute, both to her, and in thanks for a great stop in the Old Port.